Announcing the winners of the first ever Right Place Photo Caption Contest! I'd also like to give out a special thank you to all of those who linked to this post. Without your help, this contest would likely have been a complete waste of time! Out of all the wonderful entries received, I cut it down to a couple of dozen or so that actually made me laugh out loud when I first read them. I then whittled them down to a top 10, all of which are featured below. I must confess, picking an ordinal finish here was quite hard and I never thought I would need to award more than 1st thru 3rd places, but these are all so good, I just had to highlight every last one of them. #10: You do the Hokey Pokey, and you turn yourself around, that's what it's all about! #9: With John Ashcroft's departure, Harry Reid displays the Democrats' new and improved method of covering up Mark Twain's private parts. 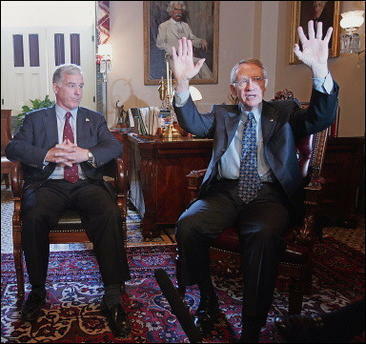 #8: Sen. Reid, flanked by Party Chair Dean, demonstrates the Democratic plan for the War on Terror. #7: Harry, you drama queen, there is no God and you know it! #6: Stop calling Howard an out of control lunatic. I've spent a lot of time with him and I still have all my fingers... just don't get too close! #4: Argh! The sun! Quick, back to the coffins, Howard! #3: You folks just back those cameras and microphones out of here until Mr. Dean's Ritalin kicks in, okay? #2: Through the power of Jesus, Harry Reid finally drove out the demon that had possessed Howard Dean since his Iowa Caucus concession speech. #1: Harry, it's the MSM! Relax, they're on our side. Take a bow, folks! Take a bow!